Cryptocurrency fans will now be able to spend their haul in a wider number of locations than ever before thanks to a new launch from Coinbase. The trading website has announced the launch of a new Visa debit card that will allow users to spend their Bitcoin, Ethereum and more. Payments can be completed with any merchant that accepts Visa, meaning there will be a whole load of real-life and online stores able to benefit from this new spending power. Users will need to download a companion mobile app called Coinbase Card, which will allow them to view and manage their finances via a mobile device. As mentioned above, the likes of Bitcoin, Ethereum and Litecoin are among the cryptocurrencies supported - any the card will automatically take its balance directly from a user's Coinbase account. The card will support cash point withdrawals as well as contactless payments - but as with other transactions, users will be charged a fee for this. There's a 2.49 percent fee charged for each transaction using the card - made up of 1.49 in conversion fees and one percent transaction fee. However there are no maintenance fees and no additional cost for ATM withdrawals - but you will need to withdraw less than £200 per month. Using the card in other European countries will incur a 2.69 percent fee, and outside of Europe will see a 5.49 percent charge. 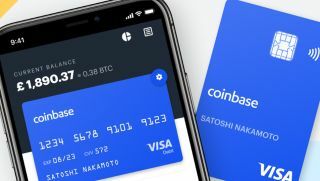 Coinbase says it is planning to roll out the card to other European countries soon, but there are no plans for a US launch just yet. The card itself is available now, but costs £4.95 to order - although the first thousand customers will get it for free.